The Babadook-I think this one is more dark fantasy than horror, but it was an amazingly well done movie with a genuinely scary monster. Highly recommended. Late Phases- Just an awesome werewolf movie. It's like a cross between an old western and the great werewolf movies of the 80s. As Above, So Below-A really intense adventure horror movie. A lot of people did not like it, but if you haven't seen it, give it a chance. The Town that Dreaded Sundown- A great meta murder mystery horror movie. Really gory, really good. Kristy-Intense with a great atmosphere and a truly creepy setting. 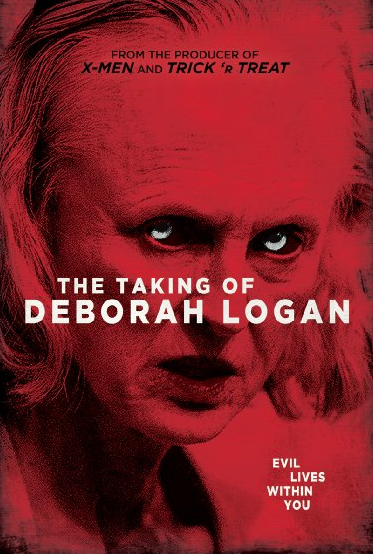 The Taking of Deborah Logan- I really like this one, it did not try new things with the found footage set up like The Den, but I enjoyed it a lot. The lead actress was phenomenal and the climax was my favorite this year. I love this series. I was a big fan of the 2nd chapter even though it was very uneven. I really can't wait to see what happens next. I've heard nothing but great things about this one and the trailer gives you an interesting set up. It looks very creepy. Despite the stupid name change, I've been looking forward to this one for months. Still have to wait until April, but I'm excited. Parnormal Activity: The Ghost Dimension- I don't know about this one, I really enjoyed the Marked Ones but everything seems to be pointing towards the franchise being on its last legs. Hopefully it will at least go out with a bang. Friday the 13th- I love slashers and Jason is my favorite. Not sure where they are going with this one, but I'm just glad we are getting a new installment. Crimson Peak- Guillermo Del Toro plus an A-list cast plus gothic horror seems like a no brainer. I'm not a fan of Victorian ghost stories, but I really want to see this one. Scream(MTV)- A lot of people are skeptical of this one, but I'm on board, even with the mask changes and stuff. I'm not sure if it will make it out next year, but I'm hopeful that it will. I think the network and the franchise will go great together, but we'll see. What about everyone else? Favorites from this year? What are you looking forward to next year?